As part of my #OTalk Student Digital Leader Intern position, I am aiming to undertake at least two chats where I support others to host an #OTalk Chat. I had the chance to support my first chat on 4th August which was hosted by @clairehannah3 on the topic of 'Exercise as an Occupation'. I felt a tad nervous about it to be honest, especially since i am friends with Claire, who was hosting, and I really wanted it to be a positive experience for her as her first time hosting an #OTalk. Thankfully the #OTalk team were really supportive (Not that I ever thought they wouldn't be), and were on hand for me to check points and help out when needed. I really loved being able to encourage and support someone to have a go at leading a chat and get involved in the #OTalk community. 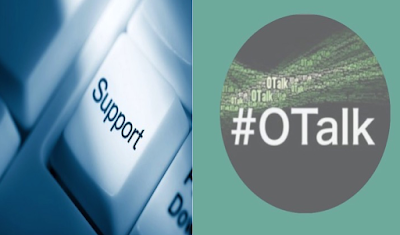 As most of you will know if you read my introduction to #OTalk, I'm really interested in helping more students get actively involved in the #OTalk community, so if you are reading this and have a topic in mind do get in touch with OTalk and we can support you to lead a chat. It is similar to hosting a chat in the fact that I was constantly keeping one eye on the time to make sure to make sure the host posted the next question on time. Very thankful for a multiply alarm feature on my iphone to remind me when to check if the next question was posted. That was a feature i used when I co-hosted a chat earlier in the year as it can be so easy to get caught up in conversations/discussions and loss track of time - the hour really does fly by. I feel for next time I may need to use more devices if i want to contribute to discussion as well as doing the 'admin' role as at points i feel I lost time switching between accounts when I wanted to contribute as me and not from the OTalk account. All in all a good first attempt at it! Your experience as a Student Digital Leader sounds so cool! I'm in OT school in the U.S., and I don't think we really have any positions like that available in our national organization. I'm also currently doing something similar as the "social media co-chair" for my state OT association, and it's been pretty fun, although it is a steep learning curve! I hope you eventually get more students involved in OTalk in the future! Because you mentioned that it's hard for you to go between profiles during the conversation, I really recommend that you try out Hootsuite, which is basically an app/website that allows you to manage multiple social media accounts (i.e. your personal Twitter account vs. the OTalk account). It's pretty easy to use, and you'll be able to participate in chats while also acting as a moderator. Give it a shot!